Crypto-city has worked out a deal to give our Citizens a 10% discount on the popular Cryptocurrency Automatic Trading Bot. :) C.A.T. If you're interested in purchasing the CAT Bot? You only need to choose markets, set the first orders and parameters (not mandatory) and then let C.A.T. algorithm trade for you. When a Ping-Pong Order is Completed, there's a Mathematical Gain. With the right choice, you will surely improve your overall gains. It's not easy to trade 24/H day on over 100 Markets, With C.A.T., You can. Does C.A.T. communicate with third part server? No, C.A.T. communicate only with the Site you're trading on. How Much Does It Costs and how can i buy it? The C.A.T. program consists of a core set of utilities, and a set of API interfaces for specific trading sites. After purchasing C.A.T., you can decide which sites API interfaces you wish to add, so buying access to all API interfaces is not mandatory. However, adding additional sites to your copy of C.A.T. can be done at any time, all you need to do is send me a PM. - After Purchasing All future releases of C.A.T. WILL BE FREE. - Your copy of C.A.T. is personal, and related to your Public API Key, so Do Not Change Your API Key or you won't be able to use C.A.T. - Refunds are not possibile (C.A.T. is not an hardware). However reselling C.A.T. is allowed, and the buyer will receive the same level of support as if they had bought C.A.T. from me personally. - Support is given only on the latest C.A.T. release. - I Am Not Responsible for site problems or bad API responses. - If you buy a copy from another C.A.T. user, I'm not responsible for any kind of problems. I will only change the nickname from "olduser" to "newUser" in my C.A.T. Users List. - If you try to scam me/other people or you try to ruin my reputation, I will report you and I will remove your key from the next C.A.T. release. - Go to https://www.bitfinex.com/account/api and create an API with READ checked for ALL Operation AND READ/WRITE for ORDERS Operation. - Go to https://www.bitfinex.com/account Set "Fees -> Fee type for Exchange orders = Currency exchange fee" and "Account Type = exchange"
- Click Api Settings, Decheck "Allow bitcoin withdrawals for this key" and "Generate New Key"
- Press the Public Api Address and Save your Private Apy key. Site will never show that key again. - Save your Private Apy key. Site will never show that key again. - First ACTIVATE 2FA on your Account and don't forget to save the SEED Generator. 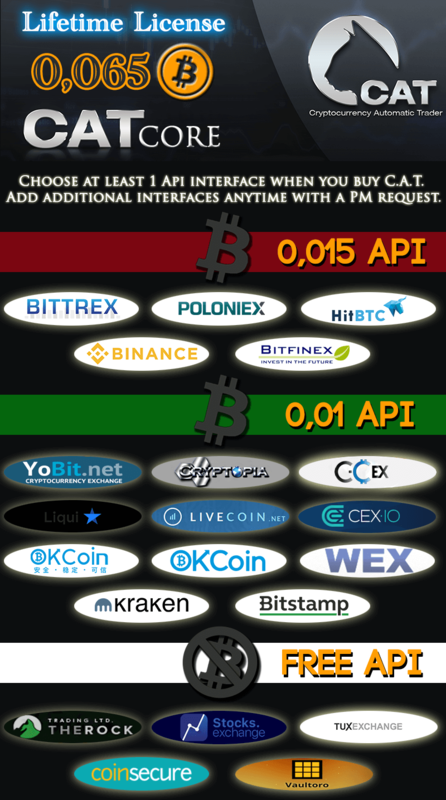 - Go to https://www.okcoin.com/user/api.do (or https://www.okcoin.cn/user/api.do) and Create your API Key with TRADE Permission. - Press "Create Api Key"